Ideas | Anthony Flint: We’re redesigning our streetscape — but what if we’re getting it all wrong? A comeback role for Boston’s theater district? Fans lined up for the world premiere of "Moulin Rouge," at the Colonial Theatre. For much of the 20th century, the road to Broadway ran through Boston, where savvy audiences at the Colonial, the Shubert, or the Wilbur routinely got the chance to pass judgment on new musicals and plays before New York ever laid eyes on them. Indeed, the city’s supporting role as one of the top pre-Broadway tryout towns in the nation was so vital that composer Richard Rodgers, of Rodgers & Hammerstein fame, used to say he wouldn’t open a can of tomatoes without first bringing it to Boston. Cole Porter heralded the Hub as one of the places where the magic of “that big first night’’ happens. Neil Simon rewrote “The Odd Couple’’ on a suggestion from Boston drama critic Elliot Norton. Tennessee Williams’s first professionally produced play, “Battle of Angels,’’ was greeted with such hostility by audiences at the Wilbur Theatre in 1940 that a planned Broadway engagement was canceled. Is Boston poised to reclaim that role? Does the current flurry of activity and optimism signal that the downtown Theater District can regain at least some of its old status as a proving ground for Broadway-bound productions? When the curtain rises this month at the Colonial, the real star will be the long-shuttered hall itself. The longer answer is much murkier, however. How shows get road-tested, and where, has changed greatly since Boston’s heyday as a tryout town, which lasted roughly from the 1920s to the early 1970s. The traditional path from brainstorm, to assembling a creative team and cast, to out-of-town production, to Broadway that “Moulin Rouge!” represents isn’t the only one. 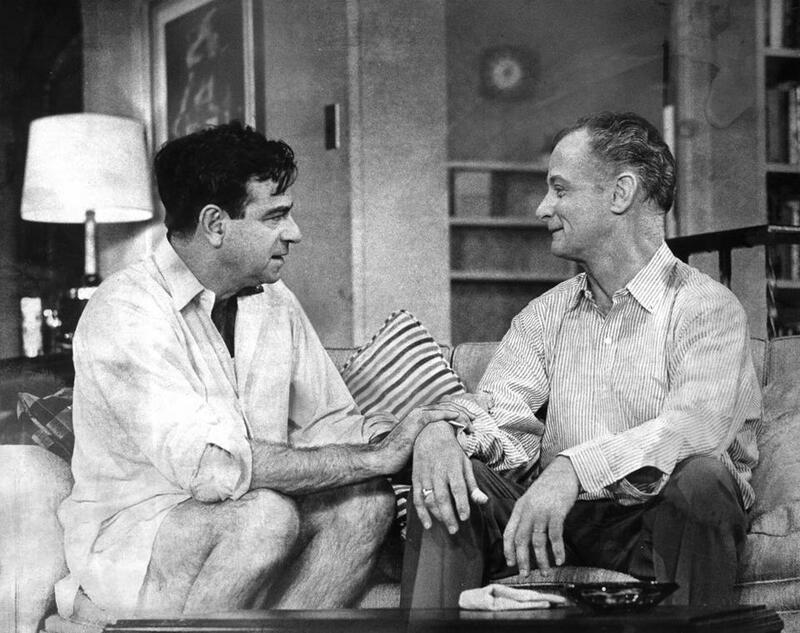 Walter Matthau and Art Carney portrayed Oscar Madison and Felix Ungar in a scene from the Neil Simon comedy "The Odd Couple" circa 1965. For an example of the transformation of the landscape, look no further than Cambridge, where in the last seven years the nonprofit, Harvard-affiliated ART has incubated such productions as “Waitress,’’ “Pippin,’’ “Finding Neverland,’’ “The Gershwins’ Porgy and Bess,’’ and “The Glass Menagerie,’’ all of which went on to Broadway. In addition, the musical “Once’’ was developed in a workshop at the ART, and “All the Way’’ was presented there (after premiering at the Oregon Shakespeare Festival), starring Bryan Cranston as LBJ, before going to Broadway. You wouldn’t have predicted that turnabout in the 1990s, when a burst of pre-Broadway activity in the Theater District prompted a 1998 New York Times article hailing “the district’s move back toward the heart of Broadway’s creative process.’’ But that proved to be a temporary recovery from the slippage that had begun years earlier, when cities such as Washington, Los Angeles, Toronto, Chicago, and San Francisco began to aggressively compete with Boston for tryouts. 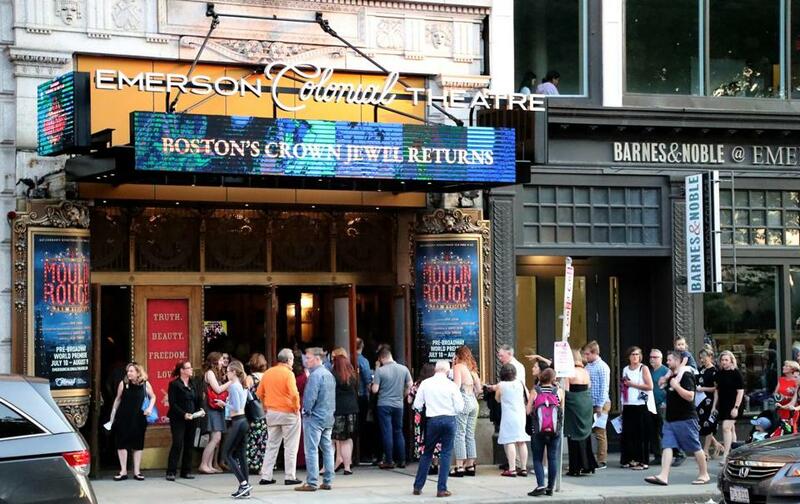 In the past two decades, Boston’s big downtown theaters have been largely relegated to the sidelines. The last pre-Broadway tryout at the Colonial Theatre prior to “Moulin Rouge!” was “High Fidelity,’’ in 2006. (In 2013, Broadway In Boston was poised to present a Broadway-bound production of “Tuck Everlasting,’’ but the show was canceled.) At the once-mighty Shubert, there have been no pre-Broadway tryouts in this century. The same is true of the Wang Theatre. The Wilbur is now a venue for comedy and music. The Charles Playhouse is home to the long-running “Shear Madness’’ (since 1980) and Blue Man Group (since 1995). 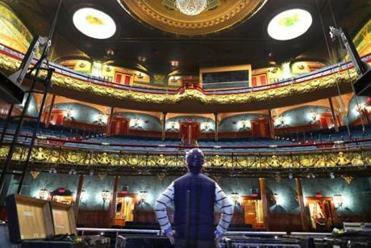 Although the Boston Opera House has often hosted touring productions since it was reopened in 2004, there have been no tryouts. 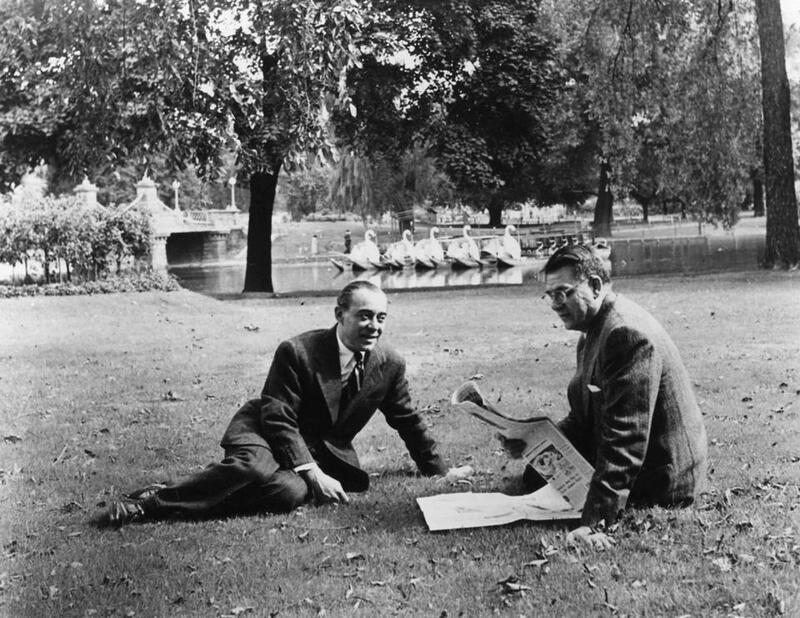 Richard Rodgers and Oscar Hammerstein II in Boston during the pre-Broadway tryout for “Allegro” in 1947. Boston’s Huntington Theatre Company, a nonprofit regional theater that was long affiliated with Boston University, has sometimes gotten a piece of the action, hosting the US premiere of “The 39 Steps’’ a decade ago before it moved to Broadway, and presenting Lydia R. Diamond’s “Stick Fly’’ in 2010 before its Broadway run the following year. Regional theaters in Western Massachusetts such as Pittsfield’s Barrington Stage Company, the Williamstown Theatre Festival, and Berkshire Theatre Group (which has theaters in Stockbridge and Pittsfield) have also occasionally served as pipelines to Broadway. Regional theaters often have an edge over commercial theaters and touring houses because it is less expensive to try out new work there, even though the Broadway producers that regional theaters partner with for tryouts usually kick in “enhancement money’’ to cover part of a show’s production costs. When it comes to the primary purpose of a tryout — giving producers, creative teams, and actors a chance to see how a show fares in front of live audiences, then make adjustments based on their reactions — regional theaters offer one important advantage: a built-in base of subscribers that is usually longer than the ones that commercial theaters can boast. That means that regional theaters can fill the seats for a month or more of performances rather than just the couple of weeks many touring houses can guarantee. “So they’re in a position to say to a producer that you don’t have to worry about losing money, we’ll take care of the box office,’’ said Viertel. Another prominent Broadway figure, Stewart F. Lane, was the producer of “La Cage aux Folles,’’ which tried out in Boston before opening on Broadway in 1983. But as early as the 1970s Lane saw the writing on the wall and began teaming up with regional theaters on productions. Like other producers, he took careful note of the blockbuster success of 1977’s “Annie,’’ which tried out at the Goodspeed Opera House, a nonprofit theater company in East Haddam, Conn. Regional theaters have held onto that edge since then. Still, the dream of making Boston’s Theater District a vital part of the tryout process again lingers among those who recall the glory days and are encouraged by the current burst of momentum. 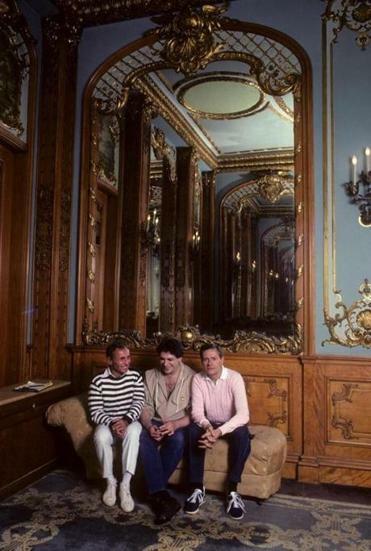 From left to right: Director Arthur Laurents, playwright Harvey Fierstein, and composer Jerry Herman in pink sweater at the Colonial Theater in Boston, Massachusetts for La Cage Aux Folles rehearsals in 1983. In separate interviews, the Boch Center’s Spaulding and Christopher Welling, president of the International Alliance of Theatrical Stage Employees, Local 11, contended that one way to bring back tryouts and the jobs they generate is to provide tax credits for Broadway-bound plays and musicals that are staged in Massachusetts or productions that begin their national tours there. After such tax-credit proposals have foundered on Beacon Hill in the past few years amid criticism that they amounted to a giveaway to theatrical producers, a new version of the proposal has been included in a current economic development bill. Whatever their disagreements on the economic particulars, Welling, Sirkin, and other people who care about Boston theater sound a strikingly similar note on the question of what tryouts once brought to the life of the city. It might be called, simply, theater magic, and the memories that brand of magic can create. Welling, whose first job as a stagehand was on the 1978 pre-Broadway tryout of Bob Fosse’s “Dancin’’’ at the Colonial, knows it’s a kind of theater in itself to see the multifarious pieces of a production, from sets to lights to costumes to music to performance, come together.